Ruth | 1001 Movies…Before I Die! Each and every time I watch a brand new Buster Keaton movie, I go into it remembering the last one I saw. So far each of them that I have seen, except the first one of course, the extreme level of quality has me continuing to hold the next one to that high standard. The problem with that, comes in with my memory. Each and every time I forget that these films start out slowly. There is the inevitable set-up of the premise, the introduction of all the main characters, and the reveal of the potential love interest for Keaton’s character(it happens in each of them). As a result I get worried in the first 15 or so minutes, that it’s going to be all slow pace, and cutesy plotting. The fact that Seven Chances was a movie about a man who desperately needs to get married by 7 o’clock on the same day, only elongates the necessary set-up of the film, and tricked me into believing that this would be the one that would simply be corny and sweet, without the usual jaw-dropping action. As in each of the others, however, I was not disappointed or let down in the least, it simply took me a little longer to get to the meat of Keaton’s athleticism, derring-do, and stunt-work. 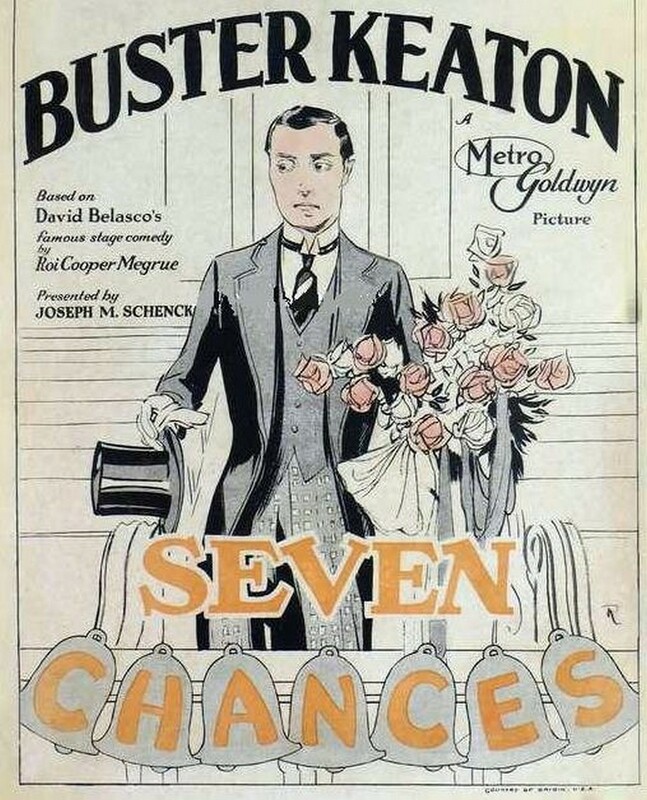 As with all of the Keaton films that I’ve seen (Sherlock, Jr., The General, and Steamboat Bill, Jr.), the plot of Seven Chances is a backdrop at best and really ends up being a device through which to deliver the action. The romance and characterization serves the purpose of setting up the scene and attracting people to the film in the first place, and while there are some fairly funny gags with Three’s Company-like misunderstandings, everyone is really there to see Keaton potentially kill himself. Once again, the mans sheer physicality is astounding. Each of the stunts is actually done by him, usually in one-unbroken take, and certainly without our modern-day concern for safety. The rock-slide sequence in particular is the defining moment of this film. The capper on a 20 plus minute chase sequence, it’s pretty insane to watch this guy run head first into a stream of rolling and bouncing rocks (I assume they weren’t really rocks, but still, his skill at avoiding all the obstacles in his path is exemplary). That being said, I don’t think this film was quite as good as any of the others I’ve seen, and I’m not quite sure what aspect or characteristic placed this film on this list in the first place. Perhaps the compilers of this list felt that Seven Chances had some unique defining quality, or maybe that it was of some great historical import, or perhaps it was simply a personal favorite, I’m not really sure. I will say that it didn’t seem that there was a real stand-out reason to choose it over something else. Perhaps there was a quota for a certain number of movies from each year, and without this film, 1925 was looking a little light. Who knows? Hopefully, I haven’t given the impression that Seven Chances is a bad film or anything. The fact that I was excited to watch it, I enjoyed it, and that I will be excited to watch the next Keaton film is a testament to his staying power as an entertainer, one who I would have been completely ignorant of, if it hadn’t been for this list.